Join our community of thousands juicing once-a-day for health and hotness! This is a challenge you can take on your own at any time. Thousands of people have signed up for this juice challenge of juicing 1x a day (with their regular meals and diet). Once you sign up you'll get a shopping list + recipes and emails EACH day from me cheering you on. This is a challenge to drink at least 1 green juice a day for 7 days straight. It's not a juice fast. 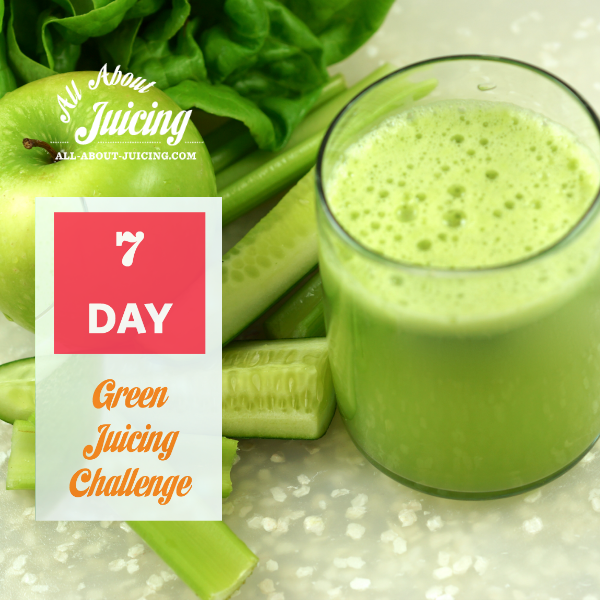 The 7 day juicing challenge is about making juicing a part of your everyday lifestyle. Not a diet or a fad, but a way of life. I like to call it the juicy life. 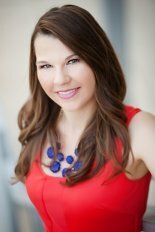 I’m here to take you on a 7-day journey to nourish your body. We have ah-mazing stories from our juice-challengers. Will you be one? Why do a juice challenge? Yes, it's fun. But more importantly, juicing is great for your body. And it’s a really easy way to get good nutrition. It will make you strong, healthy and beautiful from the inside out. But you need to juice often in order for it to make a difference in your life. Juicing is part of a lifestyle. It’s not a quick fix and not just for cleanses. It’s a great everyday way to get complete nourishment for a healthy body. It usually takes some discipline and support to make good changes in our lives. It’s also great to have a community to do it with. We’ve got that. Check, check. This is a fun way to incorporate juice into your diet and join others that are juicing too. Better sleep. Wake up without the alarm clock, and never need a nap. A happy digestive system. Get regular! Lean, bikini-ready body (the waxing is up to you). Body detox (give your bod a clean slate). The goal? To look and feel better effortlessly with the help of juice. And if you already feel great, that’s cool too. Let’s face it, challenges are just fun (well, mine are, anyway :). It's open to everyone and it's FREE. Sign up for our juice challenge here (its FREE). I’ll send you an email with the details, and the shopping lists + recipes each week. Follow us on facebook and instagram so that you stay connected throughout the challenge. Visit us daily during the challenge and tag your pics #allaboutjuicing #juicingchallenge so we can juice with you! Get the Sidekick Guide (optional). I will send you the recipes and shopping lists through email but if you are like me and like to plan things out and make it super meaningful, get the challenge sidekick guide. It includes recipes and weekly shopping lists, a special 'juicy extras' challenge, a journal, and a printable calendar. Only $7. Click here to get the guide. That’s it! This will be a fun and awesome experience for you. Grab your friends. Shout it to your family members. Do it together and start the year off right. We are going to drink one 8-20 ounce glass of freshly pressed juice at least once a day. It can be fruit juice. It can be green juice. It can be a great veggie juice. It can even be a blended juice or a smoothie, if you don’t have a juicer or just want to change it up a bit. The shopping lists and recipes are in this guide. You can use mine or your own. Drink your juice whenever you like. This challenge is flexible so that anyone-including you- can do this. Some people juice and find themselves full so they don’t want a meal- totally okay and cool. Juicing can be your breakfast, lunch, dinner or super yummy snack. If you don’t like one of the recipes, no problem, make another that you prefer or one of your own. These are fun things you can do to expand your juicy life. Challenge yourself to change up your recipes, try new produce and go outside of your comfort zone. You never know what you’ll like until you try it. And if you don’t like a recipe, that’s okay. Just don’t make it again or try to tweak it to your liking. The juicy extras are listed in the sidekick guide. During the 21 day challenge, I’ll be with you to give you tips and recipes. They will aim to keep you motivated, inspired and on track. I know that even if you are super motivated it can be difficult to change your habits. For the first few days I’ll be easing you into the challenge by giving you the easiest juice recipes. If you’ve signed up for our challenge (if you didn’t yet, do it now) I’m going to send you reminder emails each week with shopping lists, recipes and encouragement. I want to encourage you to try and stay committed to the challenge on your Facebook and Instagram wall. Letting your friends & family know what you’re doing means they can support you. Check in with me daily to stay focused. Feel free to post photos on our wall and share the ingredients you used in your juice. Please be sure to tag all your photos #allaboutjuicing and #21dayjuicingchallenge so we can see how you’re doing! I can’t wait to see how the challenge goes for you and celebrate once you’ve made the 21 days. Q: Should I make a new recipe every day? Most people like to make new recipes everyday for variety. I recommend it because we should rotate what we eat on a daily basis to ensure we get a well-balanced amount of nutrients. If you make the same recipe two or three days in a row, however, I don’t think that’s the worst thing in the world. Try to go outside the box and experiment with new flavors. Q: Do I need a juicer to do this challenge? If so, which one? This is a juicing challenge, so yes, you should have a juicer to fully participate. However, if you would like to make blender juices you can do that too. 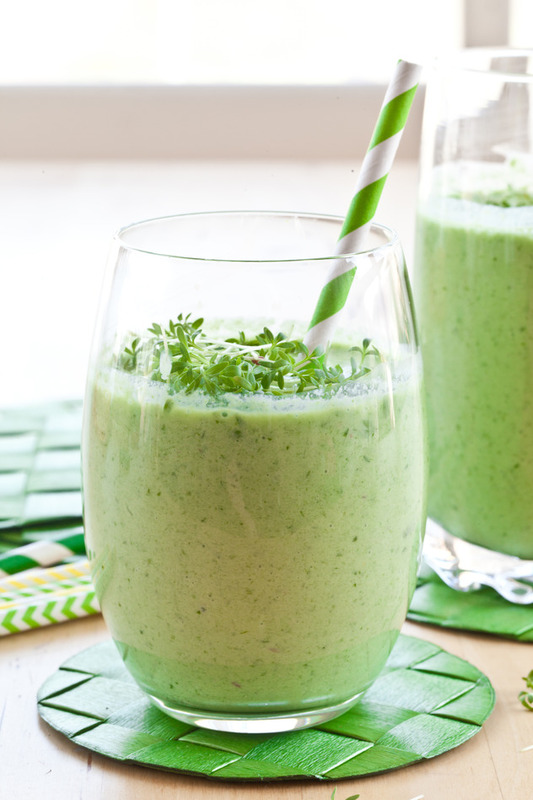 Blender juices can be just as good as juiced juices -- they are just different. The challenge would work the same if you are making blender juices, drink one a day for 21 days. To smoothie-fy any of my juice recipes, add water or coconut water to help the ingredients blend. You might also have to modify the amount of produce that would go in your blender juice. Traditionally a juicer needs more produce to make a glass of juice versus one that is made in a blender. Juicers I like include the Omega Vert, The Omega single gear, The Green Star, The Hurom, The Champion and many of the Breville juicers. For a blender, I think the Vitamix is the best on the market. Q: Can I eat food during the challenge? Absolutely, this is not a cleanse. It’s a challenge to help you incorporate juicing into your diet once a day for 14 days. Q: What should I eat during the juicing challenge? Many people stick to their regular diet. This is not a challenge to change your diet. However, you will notice more positive changes in your health if you take this time to eat better and take care of your body. If you want your body to cleanse and you’d like to use this to kick start a new chapter in your healthy-eating life, try embracing a vegetarian or vegan diet (more fruits and veggies!) and avoid all processed foods. Meats and processed foods slow down our body’s cleansing processes. A light, clean fruit and veggie diet is the most beneficial if you’re trying to turn your health around. This would include soups, salads, smoothies and raw foods recipes. More importantly, focus on clean eating. Avoid foods with ingredients that you cannot pronounce and are free of processed sugar. If you don’t want to change your eating, don’t fret, it’s no problem. Juicing once a day will still do very positive things for your overall health. This challenge is a good step towards a healthier lifestyle + enhancing your beauty. Q: I don’t have the fruit or vegetable your recipe calls for, what do I do? This often happens. Try substituting with something you do have that is similar. For example, if you don’t have kale, romaine lettuce can work well. If you are out of apples, try substituting a pear. Generally speaking, you’ll like the juices from produce that you like to eat. Always keep apples and carrots on hand as they are the most versatile produce for juicing and can be used to substitute many ingredients in juice recipes. Q: How many calories are in your juices? I don’t typically count calories so I don’t list out what it is for each recipe. When you start to incorporate clean, whole foods into your diet you’ll notice that calorie counting becomes less important. You can get an average of the calorie counts for your fresh juice by going to a reputable nutrition or calorie counting site like nutriondata.com. There, you’ll want to find the calorie count (or other nutrition data, if that’s what you are looking for, too) for each fruit or vegetable. Q: Can I juice fruit-only juices every day? You could, however, it’s best to make the majority of your juices vegetable based. While fruit juice contains natural sugar, which is different than processed sugar, it still is sugar. And sugar feeds the bad stuff in our body. That being said, fruit juices are very cleansing and very delicious. They also play a great role in our diet. In general, it’s best to eat your fruit and juice your vegetables. I do include fruit juices in these recipes simply because its easiest for those who are new to juicing and it’s usually the most loved juices when sharing with others. Q: Why is the juice challenge for this long? 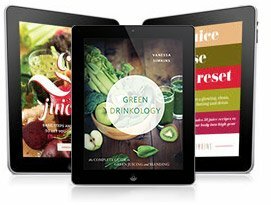 A few weeks is the perfect amount of time to help you create a new healthy beauty habit, and to learn how to make different juices and techniques for beauty centered juicing. It’s also an optimal timeframe for your body to detox and absorb the good nutrition juicing brings on so you’ll start to see some positive changes. Sign up for the juice challenge here (free! 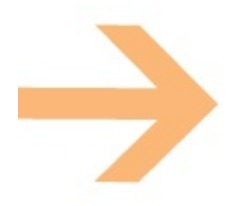 + we'll send you shopping lists and recipes). Don't forget to check your email.